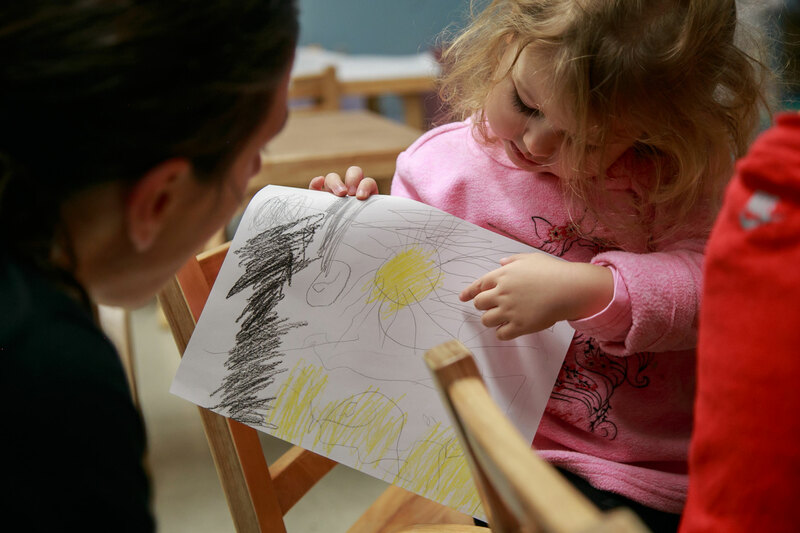 Since children learn and evolve at what seems like lightning speed, we make sure to document their work every day so that you can see the progress your child is making firsthand. Children’s work fill our walls, and we invite you to explore the room when you drop off and pick up your child. Our art is all about process, not product, as children explore materials and their own abilities. We send home daily pictures and go more in-depth at parent-teacher conferences twice a year, or feel free to reach out more often! We only ask that you not discuss children at length during drop-off and pick-up when teachers are busy welcoming children into the room and making sure they leave safely. We have been so happy with our experience at JCC Brooklyn Windsor Terrace. Our son has learned so much, runs in to class every day, and comes home so happy. We love his teachers, the directors, and our entire experience. We are looking forward to next year! Best outdoor space in Windsor Terrace. At JCC Brooklyn – Windsor Terrace, we have an outdoor play space where the children engage in cooperative games and free play. Prospect Park is only one block away and we take advantage of it by going on nature walks, having fun at the playground, enjoying being by the lake and learning about the many plants, birds and animals that share our world with us.